“David's Shield And Buckler” from Christian Faith Publishing author Jim Newnam is a collection of poetry inspired by God. The poetry within this collection inspires readers to embrace the strength and protection of their faith. “David's Shield And Buckler”: a collection of poetry that inspires others to arm themselves with the strength and protection of their faith. 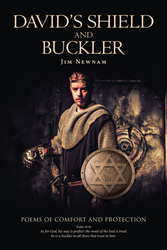 “David's Shield And Buckler” is the creation of published author, Jim Newnam. Jim was a printer for forty years. He is now retired. He was raised by his grandparents from the age of five to the age of twenty. His Godly grandmother kept him in church. He was six-years-old when he was saved on a summer revival night at Second Baptist Church in West Plains, Missouri. He and his wife have been married for over forty-four years. God has blessed them with two daughters and eight grandchildren. He currently enjoys a life filled with hunting, fishing, and poetry. Published by Christian Faith Publishing, Jim Newnam’s new book is a collection of Christian poetry. David was a warrior king of Israel. He was called “man after mine own heart” by God. David’s shield and buckler protected him from the weapons of the enemy. Author Jim Newnam prays the poems within the pages of “David's Shield And Buckler” will provide similar protection for his readers. They are poems that God gave to him. View a synopsis of “David's Shield And Buckler” on YouTube. Consumers can purchase “David's Shield And Buckler” at traditional brick & mortar bookstores, or online at Amazon.com, Apple iTunes store, or Barnes and Noble. For additional information or inquiries about “David's Shield And Buckler”, contact the Christian Faith Publishing media department at 866-554-0919.